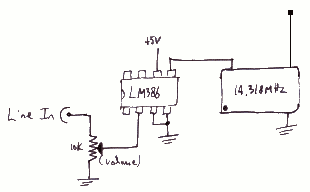 This is a really cheap and probably illegal shortwave transmitter, don't build it. 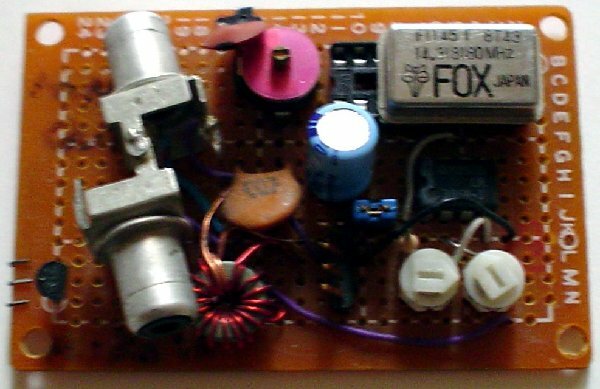 It just feeds the output from an LM386 audio amplifier directly into the power pin of a crystal oscillator can to produce AM-modulated shortwave radio frequencies. This works better than one might expect -- this particular oscillator seems to provide a stable waveform with voltages anywhere from 2.0v to 5.0v! Also note that I was making this up as I went along when I first built it, so there are extra components on the board that do nothing. These oscillator cans make a squarewave, so you'll want to add a filter of some sort if you don't want to blanket a huge radio band.